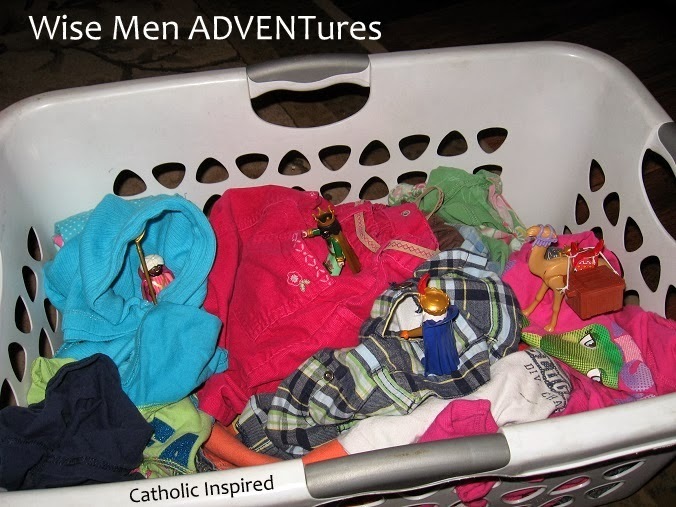 As promised, I'm going to be posting some of our Wise Men ADVENTures! If you didn't read my last post about our wise men, please click here to read more about our Christ-centered Elf on the Shelf Alternative! At the bottom of this post is our Wise Men ADVENTures Link-up!! 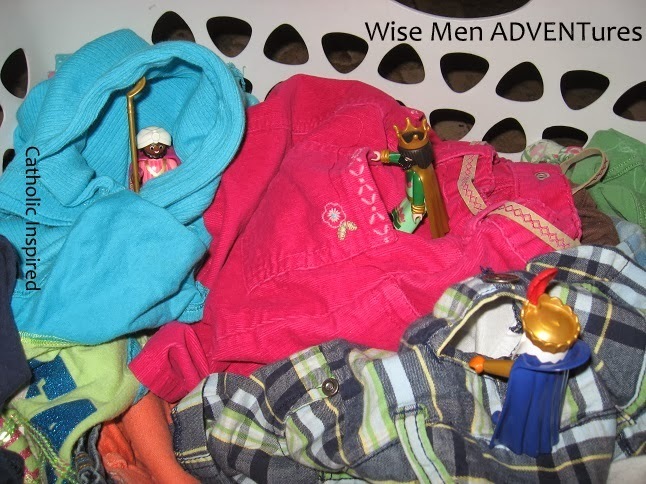 Yes, Advent is here and Our Wise Men ADVENTures have begun, again!! The wise men are searching for the infant Jesus and once again Caspar just can't stay focused! AND they only just started the search! 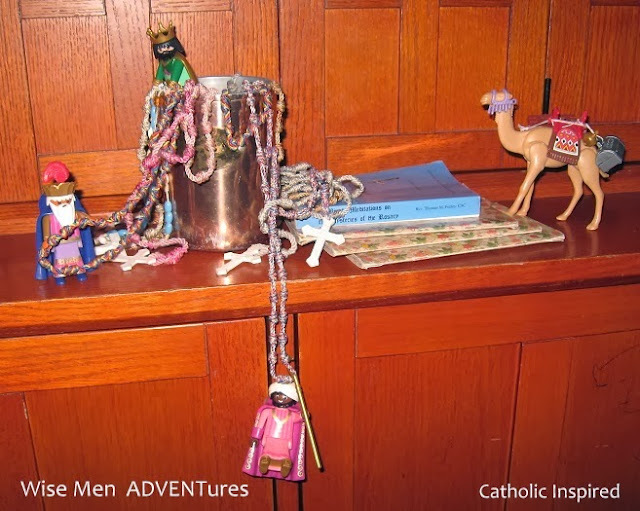 During the first night, the three little fellows searched in our Rosary can! Melchior and Balthazar are checking the pockets, but I think Caspar is making himself a tent! For guys that size it might be a great place to take a nap! Well, they sure are off to a fun start! I'll be back in a few days to post some more of their ADVENTures! 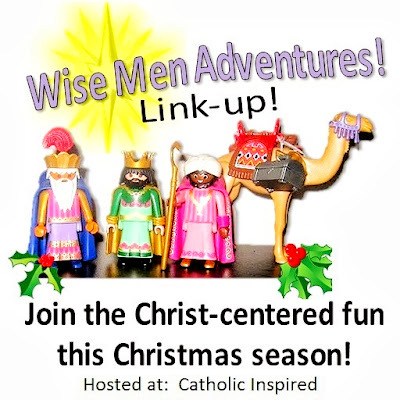 For now, you might like to add your post about your Wise Men and their adventures, or visit other blogs to see what their wise men are doing! What an absolutely FUN and clever activity...I had my youngest search out our playmobile nativity set...she found the Wise Men (missing a crown, and the camel isn't too sturdy) but we are going to give this a go! I am so excited to be linking up this year! My 5 kids are already having so much fun with this. Thanks for the inspiration!!! Anyone have a suggestion for how to get rid of an elf and introduce the wise men? We figured we would leave a note from the elf saying she has been reassigned, but how to we introduce the wise men idea? Do you have rules about the kids playing with them once they've found them? Thanks! This is so fun! I think kids appreciate honesty and appreciate being given that respect. No harm in telling the kids that the elf was a game and now you'll be starting a game that focuses more directly on Jesus. I was planning on having the kids leave them alone each day but have allowed them to play until I tell them to stop. Then they put them in a special drawer (their idea) and let them "rest" for the night time journey! Oh gosh, I'm loving this so much. I may need to start a pinterst board with for Wiseman ADVENTures! Are we supposed to post multiple times? Should I just wait until I have a recap of the whole adventure to post again? Thank you for coming up with this idea and sharing it with us all. Our family is having a great time with it. I'm looking forward to going through everyone else's ideas. Thanks for hosting this Link Up and for sharing your great idea with all of us! I have been looking for an Elf on the Shelf alternative idea for years. My 10 year old sets the 3 Kings up every night for her 3 little brothers, and my husband takes a picture for me each morning. A no-work-for-Mom Advent tradition - I love it! We just started yesterday and it's been a huge hit in my home! I never liked Elf on the Shelf but this I simply LOVE!!! I started my blog today, but I must admit I've got a lot to learn! I tried to add my link above but I kept getting an error. We started this tradition at our Catholic school and the kids (and adults!) have really enjoyed it! Thank you so much for such a great idea!